Hyperkalemia can be difficult to diagnose clinically because symptoms may be vague or absent. The fact, however, that hyperkalemia can lead to sudden death from cardiac arrhythmias requires that physicians be quick to consider hyperkalemia in patients who are at risk for it. [17, 20] See the electrocardiogram below. Widened QRS complexes in hyperkalemia. See also Can't-Miss ECG Findings, Life-Threatening Conditions: Slideshow, a Critical Images slideshow, to help recognize the conditions shown in various tracings. Electrocardiography is essential and may be instrumental in diagnosing hyperkalemia in the appropriate clinical setting. Electrocardiographic changes have a sequential progression that roughly correlates with the patient’s potassium level. Potentially life-threatening arrhythmias, however, can occur without distinct electrocardiographic changes at almost any level of hyperkalemia. If the hyperkalemia is known to be severe (potassium >7.0 mEq/L) or if the patient is symptomatic, begin treatment before diagnostic investigation of the underlying cause. Individualize treatment based upon the patient's presentation, potassium level, and ECG. Dialysis is the definitive therapy in patients with renal failure or in whom pharmacologic therapy is not sufficient. Any patient with significantly elevated potassium levels should undergo dialysis, as pharmacologic therapy alone is not likely to adequately bring down the potassium levels in a timely fashion. Hyperkalemia is a potentially life-threatening illness that can be difficult to diagnose because of a paucity of distinctive signs and symptoms. The physician must be quick to consider hyperkalemia in patients who are at risk for this disease process. Because hyperkalemia can lead to sudden death from cardiac arrhythmias, any suggestion of hyperkalemia requires an immediate ECG to ascertain whether electrocardiographic signs of electrolyte imbalance are present. Potassium is a major ion of the body. Nearly 98% of potassium is intracellular, with the concentration gradient maintained by the sodium- and potassium-activated adenosine triphosphatase (Na+/K+ –ATPase) pump. The ratio of intracellular to extracellular potassium is important in determining the cellular membrane potential. Small changes in the extracellular potassium level can have profound effects on the function of the cardiovascular and neuromuscular systems. The normal potassium level is 3.5-5.0 mEq/L, and total body potassium stores are approximately 50 mEq/kg (3500 mEq in a 70-kg person). Minute-to-minute levels of potassium are controlled by intracellular to extracellular exchange, mostly by the sodium-potassium pump that is controlled by insulin and beta-2 receptors. A balance of GI intake and renal potassium excretion achieves long-term potassium balance. Tran HA. Extreme hyperkalemia. South Med J. 2005 Jul. 98(7):729-32. [Medline]. Khanna A, White WB. The management of hyperkalemia in patients with cardiovascular disease. Am J Med. 2009 Mar. 122(3):215-21. [Medline]. Einhorn LM, Zhan M, Hsu VD, et al. The frequency of hyperkalemia and its significance in chronic kidney disease. Arch Intern Med. 2009 Jun 22. 169(12):1156-62. [Medline]. Segura J, Ruilope LM. Hyperkalemia risk and treatment of heart failure. Heart Fail Clin. 2008 Oct. 4(4):455-64. [Medline]. Weisberg LS. Management of severe hyperkalemia. Crit Care Med. 2008 Dec. 36(12):3246-51. [Medline]. Krogager ML, Eggers-Kaas L, Aasbjerg K, et al. Short-term mortality risk of serum potassium levels in acute heart failure following myocardial infarction. Eur Heart J Cardiovasc Pharmacother. 2015 Oct. 1 (4):245-251. [Medline]. [Full Text]. Norring-Agerskov D, Madsen CM, Abrahamsen B, et al. Hyperkalemia is Associated with Increased 30-Day Mortality in Hip Fracture Patients. Calcif Tissue Int. 2017 Feb 17. [Medline]. Schepkens H, Vanholder R, Billiouw JM, Lameire N. Life-threatening hyperkalemia during combined therapy with angiotensin-converting enzyme inhibitors and spironolactone: an analysis of 25 cases. Am J Med. 2001 Apr 15. 110(6):438-41. [Medline]. Gronert GA, Theye RA. Pathophysiology of hyperkalemia induced by succinylcholine. Anesthesiology. 1975 Jul. 43(1):89-99. [Medline]. [Full Text]. Hawkins RC. Poor knowledge and faulty thinking regarding hemolysis and potassium elevation. Clin Chem Lab Med. 2005. 43(2):216-20. [Medline]. Sterns RH, Rojas M, Bernstein P, Chennupati S. Ion-exchange resins for the treatment of hyperkalemia: are they safe and effective?. J Am Soc Nephrol. 2010 May. 21(5):733-5. [Medline]. Rogers FB, Li SC. Acute colonic necrosis associated with sodium polystyrene sulfonate (Kayexalate) enemas in a critically ill patient: case report and review of the literature. J Trauma. 2001 Aug. 51(2):395-7. [Medline]. McGowan CE, Saha S, Chu G, Resnick MB, Moss SF. Intestinal necrosis due to sodium polystyrene sulfonate (Kayexalate) in sorbitol. South Med J. 2009 May. 102(5):493-7. [Medline]. Lee J, Moffett BS. Treatment of pediatric hyperkalemia with sodium polystyrene sulfonate. Pediatr Nephrol. 2016 May 23. [Medline]. Beccari MV, Meaney CJ. Clinical utility of patiromer, sodium zirconium cyclosilicate, and sodium polystyrene sulfonate for the treatment of hyperkalemia: an evidence-based review. Core Evid. 2017. 12:11-24. [Medline]. [Full Text]. Simon LV, Farrell MW. Hyperkalemia. 2018 Jan. [Medline]. [Full Text]. Te Dorsthorst RPM, Hendrikse J, Vervoorn MT, van Weperen VYH, van der Heyden MAG. Review of case reports on hyperkalemia induced by dietary intake: not restricted to chronic kidney disease patients. Eur J Clin Nutr. 2018 Mar 27. [Medline]. Betts KA, Woolley JM, Mu F, McDonald E, Tang W, Wu EQ. The prevalence of hyperkalemia in the United States. Curr Med Res Opin. 2018 Feb 21. 1-8. [Medline]. Viera AJ, Wouk N. Potassium Disorders: Hypokalemia and Hyperkalemia. Am Fam Physician. 2015 Sep 15. 92 (6):487-95. [Medline]. [Full Text]. Loutradis C, Tolika P, Skodra A, Avdelidou A, Sarafidis PA. Prevalence of Hyperkalemia in Diabetic and Non-Diabetic Patients with Chronic Kidney Disease: A Nested Case-Control Study. Am J Nephrol. 2015. 42 (5):351-60. [Medline]. Grodzinsky A, Goyal A, Gosch K, et al. Prevalence and Prognosis of Hyperkalemia in Patients with Acute Myocardial Infarction. Am J Med. 2016 Aug. 129 (8):858-65. [Medline]. [Full Text]. Sarwar CM, Papadimitriou L, Pitt B, et al. Hyperkalemia in Heart Failure. J Am Coll Cardiol. 2016 Oct 4. 68 (14):1575-89. [Medline]. [Full Text]. Kovesdy CP. Updates in hyperkalemia: outcomes and therapeutic strategies. Rev Endocr Metab Disord. 2017 Mar. 18 (1):41-7. [Medline]. [Full Text]. Stiles S. FDA Approves Potassium-Binder Patiromer (Veltassa), New Option for RAAS-Inhibitor–Treated Patients. Medscape. 2015 Oct 21. [Full Text]. Brown T. FDA Approves Lokelma for Hyperkalemia. Medscape Medical News. 2018 May 18. [Full Text]. Widened QRS complexes in a patient whose serum potassium level was 7.8 mEq/L. 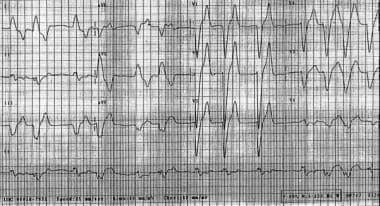 ECG of a patient with pretreatment potassium level of 7.8 mEq/L and widened QRS complexes after receiving 1 ampule of calcium chloride. Notice narrowing of QRS complexes and reduction of T waves.